If you follow me on Twitter you would have seen that over the past month or so I managed to get completely hooked on U.S. TV series, Dexter. Like every other hot blooded female that watches Dexter I developed an intense crush on Detective Joey Quinn, but it wasn't until Season 7 I found my own style crush. Nicole LaLiberte, as well as having the most beautiful surname in the world, managed to grab my attention with her big doughy eyes and freckled face hidden under a messy full fringe playing the minor role of drug addict, Arlene Schram, in Season 7 of Dexter (top right picture). She instantly reminded me of a late 60's/early 70's groupie girl. 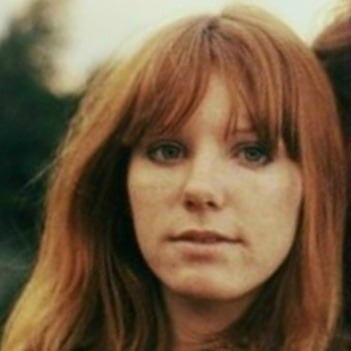 Particularly, simply because of her fiery locks, Pam Courson, whom is another huge style inspiration to me. I picked up on her because she has similar features to myself concerning hair colouring, skin tone and freckles, but she's just generally 1000x more awesome and beautiful. There are times when I consider ditching my ginger locks in favour of being blonde, but then I discover a red-headed beauty like Nicole and wonder why I would ever want to get rid of it. Strangely, there's not much information available about her online, but in all that I did discover she has a wonderful sense of effortlessly, laid back sense of style that I would love to be able to emulate as well as her. Oh wow now she's hot!! For a moment, I thought that was you! She's gorgeouuuus! You really do look like her! !